You want to visit the island of Thassos – Greece and need help planning your perfect vacation/holiday/trip? 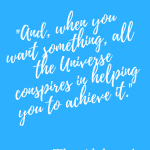 Look no further, I’m here to help you! 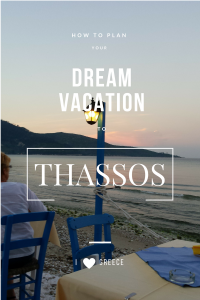 Let’s dive into my personal travel guide where you can find tips & tricks on how to get to Thassos Island, what to do once you are there and where to stay. Located in northern Greece, the Island of Thassos (also named the Emerald Isle for its green vegetation) is, without a doubt, one of the most beautiful islands in Greece and a very popular holiday destination. Thassos is the northernmost Greek island, located in Kavala Gulf with 8 km separating it from the mainland. The only way to reach it is by ferry boat from Kavala or Keramoti. There is no airport on the island, but there are two airports on the mainland: Kavala International Airport “Alexander the Great” (KVA) – the smaller but the closest one (about 20 minutes drive from the airport to the ferry boat) – and Thessaloniki International Airport “Macedonia” (SKG) – the furthest and the larger one (around two hours drive from the airport to the ferry boat). As most Greek islands, Thassos has its share of beautiful sceneries with mountains covered in pine forests that descend directly into the Aegean Sea, sandy beaches and olive plantations. As all the Greek islands, Thassos is also surrounded by beaches with sand or gravel and waters in different shades of blue and green. It even has a natural swimming pool in a rock named Giola. 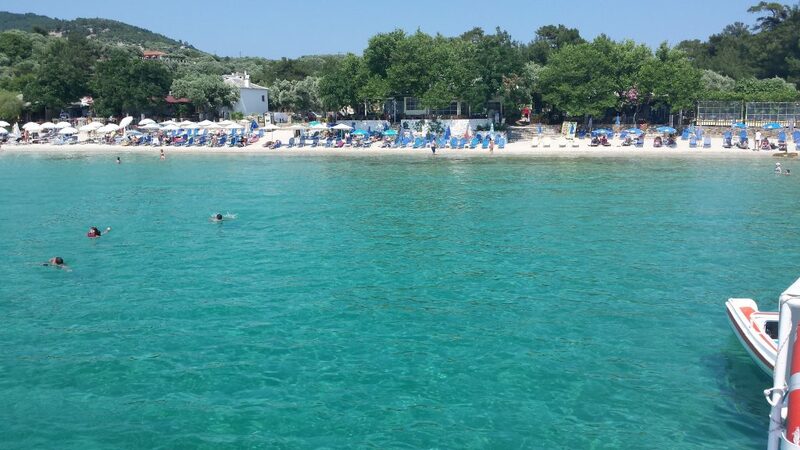 Psili Ammos Beach – sandy beach, lounge chairs, tavernas, beach bar – great for families with small children and young people attracted by the parties organized here. Thassos is an island full of tavernas that serve fresh seafood and fish, greek salads with housemade olive oil, homemade sweets, lemonade made with fresh lemons and honey, wine. Every tavern offers you freshly baked bread with olive oil or butter and cold water for free; some of them even offer you something sweet, like a small piece of cake, a piece of watermelon or some homemade jam at the end of your meal. Thassos is full of history and myths. There are archeological sites attesting to its rich and old history. It seems that there was discovered the tomb of Cassius. 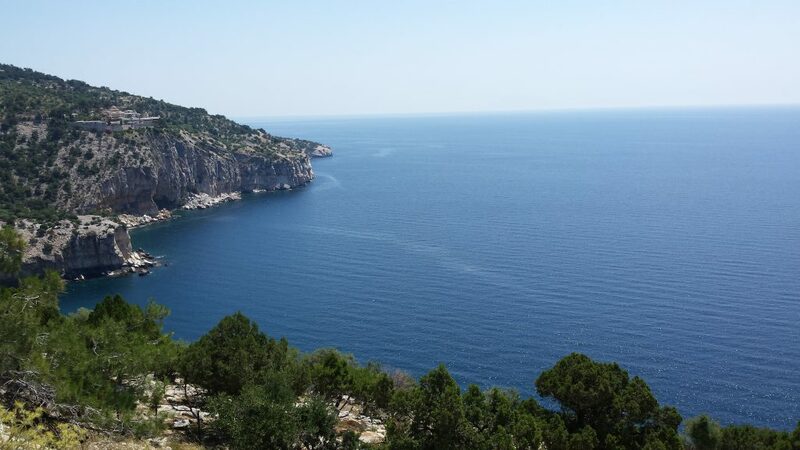 It is also said that Thassos was the island of the mythological Sirens that attracted the sailors with their magical singing and then killed them. The Old Oil Factory, dating from 1915 – in Panagia; is the only working oil factory in Greece that still uses water to produce olive oil. *We stayed at Arion Hotel, a very beautiful hotel, next to Golden Beach. We had an amazing view of the sea, we caught the sunrise and the full moon one night. They also have some two rooms apartments (more like bungalows) near the hotel where you can enjoy your stay. *Another great hotel recommended by some friends is Alexandria Golden Boutique Hotel also right next to Golden Beach. This is a luxury hotel, with private beach, spa and wellness center, massage, fitness center, free Wi-Fi, and parking. If you want to find out more information about this beautiful island, check out Iuliana’s diary post. I hope I sparked your curiosity and you will take a chance on the beautiful Island of Thassos – Greece. Very Nice and great tips on planing a trip to Greece! I love Greece and need to go back and will bookmark this for sure ! 🙂 Thank you for sharing! Thank you! You should visit Greece; it’s a beautiful country. Gosh, I’d love to visit Greece sometime! For it’s beautiful sights AND history. 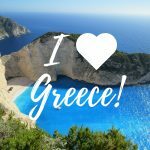 Thank you, I am planning to travel to Greece and your tips will be helpful! wow honestly I have never heard of this spot in Greece but now I want to go! Ooh, this looks so nice and warm. We usually travel to the mountains on our vacations but I would love a nice beachy Mediterranean trip. The pictures are beautiful! This is wonderful! My boyfriend and I want to go to Greece for our honeymoon and I find this post extremely helpful, so thank you! I’ll save this and I’ll have it in mind for future reference! The pictures are gorgeous by the way. Makes me want to go right now, I don’t want to wait until I get married to visit those amazing places! I travelled to Greece for the first time in November and visited Andros Island for five days, must say that it surpassed all my expectations, especially as it’s not overly commercialised like Santorini and Mykanos. Loved the food too, especailly fava! Iga, I love the less commercialized islands! They are the best. That’s why I like Thassos so much. Look at that blue, blue water – stunning! I plan on visiting Greece this summer and will have to put this on my itinerary. How long do you recommend staying for? Thank you, Michelle! You should visit any Greek island, they are amazingly beautiful! I’ve never visited Greece, but the Island of Thassos looks completely stunning. I can see where it gets its emerald nickname from. 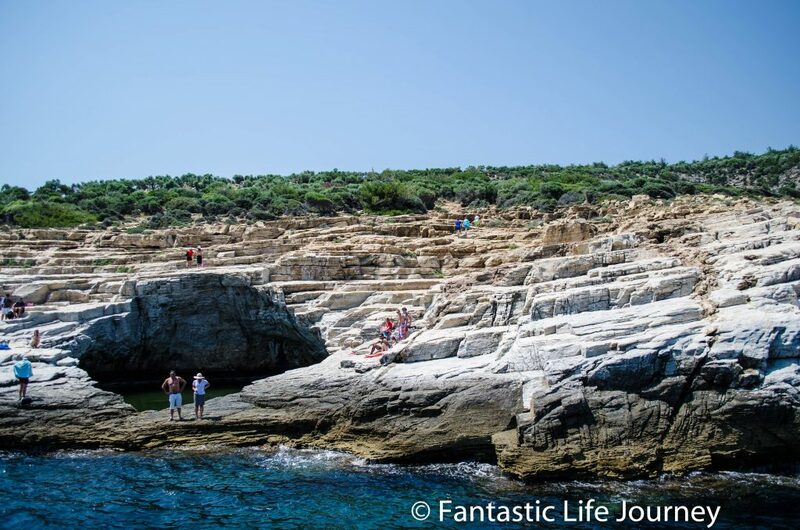 I would love to swim in the Giola natural pool, it looks like it could be a great way to cool off from al that Grecian sunshine! Greece would be such a dream vacation for me. The food, the sun, the views Is there anything that Greece doesn’t have?? I have always wanted to visit Greece. Some great tips and I wasn’t so aware of the islands to visit while there. Thank you. Never been in Greece, I’m thinking to do that next year. Great recommendation, thank you. Thassos Island looks so sunny and relaxing. Thank you! It’s a great Island. You would enjoy it, especially if you like to explore small villages and to relax. Ummmm….Yes! Take me there please!! Is the water really that blue?? I’m so jealous. Thank you for sharing this. I NEED to go here – dying to visit Greece someday! Bookmarking this! You have to visit Greece! It’s a wonderful country, full of history and great culture. This is one place surely on my bucket list. Imagine the epic Odyssey becoming a reality. 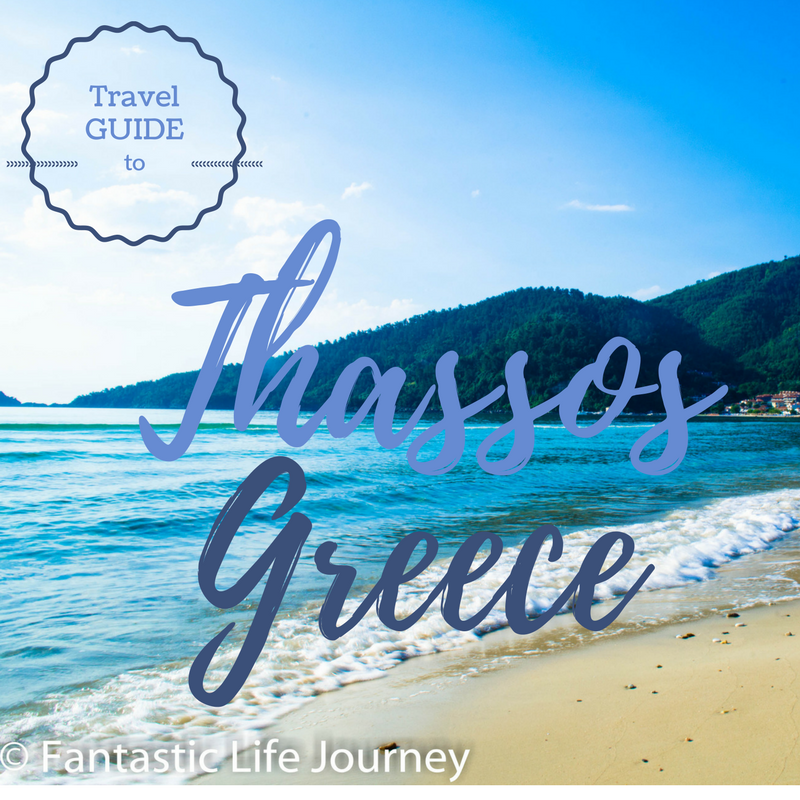 I’ve been dying to visit Greece, and I’ll have to add Thassos to my list of places to visit! It looks like an awesome place, and I would love to visit those archaeological sites! You should visit it Julia, it’s a great Island! You would love the archaeological sites. I was always Interested in Greece,but didn’t knew it had so many Awesome Beaches too. Are there WOOOF and Hostels in Thassos ? Greece has such beautiful beaches! I don’t know about WOOOF or hostels, but you can find cheap accommodation like apartments or rooms in villas. Such a great natural swimming pool and fabulous beaches, thanks for the info. Thank you, Sharon! I’m happy you enjoyed reading it.